The Sinopia Quartet comprises four of Scotland's leading young professional string players. 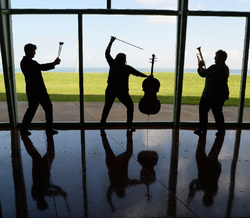 Graduates of the Royal Conservatoire of Scotland, Cambridge University and The Guildhall School of Music, they have gained various chamber music, orchestral and solo prizes. Drumpetello is a unique and dynamic ensemble featuring trumpet (Mary Thornton), cello (Carrie Pierce) and percussion (Matthew McClung). Separately and together they have performed interactive educational programs for thousands of school children. They are award-winning educators and performing musicians, having entertained audiences on five continents with their unique blend of informative demonstrations and dazzling virtuosity. They are in demand as core and substitute members of the symphony orchestras of Corpus Christi, Victoria, San Antonio, Mid-Texas, and the River Oaks Chamber Orchestra. As recipients of a 2014 Faculty Innovation grant, they have commissioned new works from several composers, to be based on the folk legends, myths, and melodies of Mexico and to be premiered in 2015. Drumpetello is currently in residence as faculty at the School of Arts, Media and Communication at Texas A&M University – Corpus Christi. The Bill Fleming Quartet formed in 2009 and since then have performed internationally, as well as undertaking numerous Scottish Tours. Repertoire:-The Bill Fleming Quartet’s repertoire spans from swing to bebop, blues, ballads, Latin and contemporary originals. Examples of works include music by Duke Ellington, Cole Porter, Miles Davis and Dizzy Gillespie. 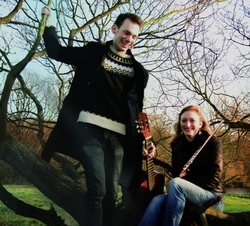 Emily Andrews and David Massey met in 2009 at the Royal Academy of Music while playing in the orchestra for a musical (David on the banjo, Emily on the piccolo). They decided to have a go on their usual instruments and quickly formed their duo partnership. Since then they have both graduated with Distinctions in their Masters degrees, and are now freelancing in London. Emily and David are expanding the boundaries of flute and guitar duo playing. They enjoy programming familiar favourites with lesser-known works, and are becoming well-known for their own arrangements, both of classical works and folk tunes. 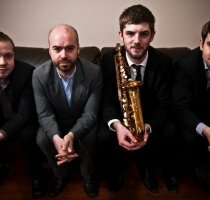 They actively commission new music, including ‘Journey Home’ by Scott Lygate, which was written for their Scottish Tour, and premiered in Stranraer on 31st January 2013.